(NaturalNews) As the nation's lawmakers continue to bore through the details of the upcoming federal farm bill revision, a number of forward-thinking members of Congress are simultaneously pushing for the antiquated and indefensible prohibition on hemp farming to be lifted as part of its new provisions. And included among these proponents of hemp legalization is Kentucky Senator Rand Paul, who is reportedly working with Senate Minority Leader Mitch McConnell to pass an amendment to the new farm bill that would once again legalize industrial hemp production in the U.S., and consequently jump-starting the national economy. Even though hemp contains less than one percent tetrahydrocannabinol (THC), the primary psychoactive compound found in marijuana, the Controlled Substances Act erroneously recognizes hemp as a Schedule I "drug" with "a high potential for abuse," despite the fact that it is impossible to get high from smoking or eating hemp. Other Schedule I drugs include substances like heroin and LSD (lysergic acid diethylamide), and of course marijuana, none of which are in any way similar to hemp in terms of how they are used. On the contrary, industrial hemp has vast potential to sustainably replace many industrial applications that rely on oil, genetically-modified (GM) crops, and various other unsustainable and heavy-polluting source materials. Hemp is arguably the most versatile crop known to man with more than 25,000 known uses, including its amazing ability to be transformed into consumer goods like durable rope, paper, clothing, reinforcement material for concrete and automobiles, and even fuel. And the best part about hemp is that it requires minimal water and other natural resources to grow, and actually helps to clean up the natural environment where it is planted and cultivated. "If hemp were legal to grow in the U.S., we would be creating more jobs here in the U.S. and generating more money for our own country instead of giving our money to other countries," says Dana Dwight from Forbidden Leaf. 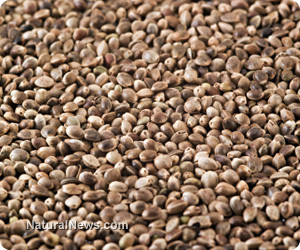 Hemp can legally be imported into the U.S. to create things like hemp oil and hemp protein, but American farmers have been needlessly barred by the federal government from participating in this lucrative market for about 75 years. "In 1619 there were 'must grow' laws passed in America; if you were a farmer back then and you didn't grow hemp you would have been jailed or kicked out of the country as a non patriot," she adds, as quoted by The 420 Times. "Our government has been so hypocritical over hemp. It just doesn't make sense." Needless to say, the federal government continues to stunt the American economy by preventing U.S. farmers from growing hemp, all the while allowing the crop to be legally imported from places Canada and Europe. But "we the people" have the opportunity to change this by supporting the passage of the Industrial Hemp Farming Act of 2013, which would not only differentiate between marijuana and hemp, but also exempt hemp from being categorized as a Schedule I drug when individual state laws recognize hemp as a legal crop.